At release, Wingal was a card that was run sparingly, and avoided altogether if possible. Alternate artwork variants from the original trial deck would find a brief place with cardfighters of February 2011, if only because there were no other grade 1s to replace him with. He had a neat combo with Starlight Unicorn that allowed him to boost Blaster Blade for 21000 power, but it only worked twice in a fight at most, and most people would prefer Blaster Blade as their vanguard to prepare for Gancelot. Some cardfighters wised up to the mixed-clan rules more quickly and substituted him with Bahr, but otherwise Wingal was a card that came and went. His combo was replicated countless times, but with the exception of Nightmare Baby was by and large sidelined for more versatile units with 7000 and higher power. In set 4 his darker counterpart Doranbau manifested, and much to Wingal's woe this copy was vastly improved by two factors; first, with Blaster Dark as the vanguard Doranbau could create a line that swung for 20000 total power, enough to pressure all but Genocide Jack and Cannongear. If by some chance a ShadowPala cardfighter were stuck at grade 2 for another turn, Doranbau made the fight much more survivable and boosted their odds of living to see grade 3. 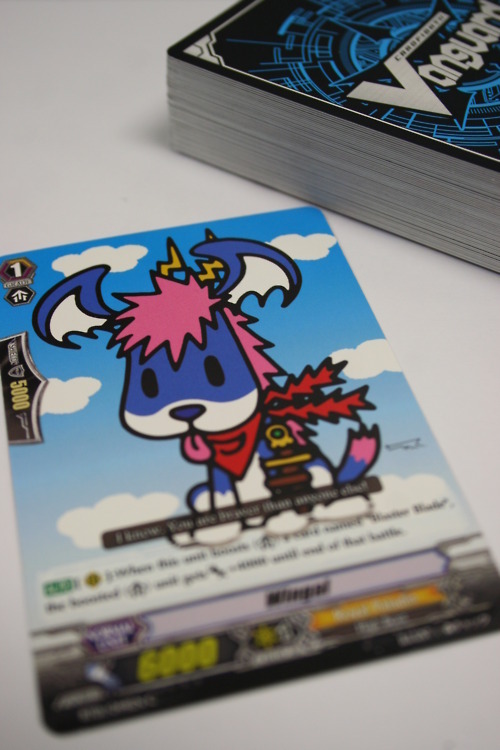 Second, Doranbau was an ideal sacrifice for Phantom Blaster Dragon, as at the time of set 4's release Dark and Blaster Dragon rides were typically sandwiched together rather than spread apart by several turns as The Dark Dictator or Ildona. Similar revivals from other clans are facing varying success. Nightmare Baby has already fallen out of favor due to Blue Dust being outmoded by Emblem Master; Queen of Heart managed to survive until the third set for the same initial reasoning as Doranbau, but was mostly replaced by the Death Army series due to their combo with Asura Kaiser, and then Dancing Wolf for having a more consistent 10000-boost that works with both Asura Kaiser and Azure Dragon. Doranbau has always been around but is now finding professional favor once more, as the release of Dordona in extra booster 3 gives him another grade 2 that he can at the least reach 16000 with for use on non-crossride units. Counting Masquerade for Blaster Overlord decks, Doranbau can form an 18000 line, giving him some degree of flexibility comparable with the original. All of these however, are missing Wingal's fundamental compatibility with Akane and RoPala's general ability to call any part of the formation with cards like Alfred and Star Call. Later releases have replaced these types of boosters altogether with 11000-power base 6000 boosters like Charjgal and Feather Penguin, but their soulblast cost misses some of the original's appeal as a free boost. It's an interesting revival to observe, and while these cards will mostly only see Apocalypse Bat-style play being run in x2 rather than the straight-up x4 that base 8000 units get, the mere fact that old cards are seeing increasing play in the new format is promising.